Anser Innovation started with a vision: to enable “being there from anywhere” through internet-based consumer electronics designed to enhance remote care. To do just that, Anser’s Co-founder, CEO and Director Lisa Lavin, used her background in med care and pet care to steer her company toward the retail pet market. There they developed PetChatz, a digital daycare solution for the home alone pet. Utilizing a two-way audio-visual system, PetChatz allows pet owners to check in on their furry friends, and even dispense treats, when they’re away from home. When SciTechsperience met with Lavin and her team this past fall, we got the inside scoop on Anser’s newest project, Ōmcare, a telehealth technology solution designed to provide remote care and assist people in taking the right medication at the right time. 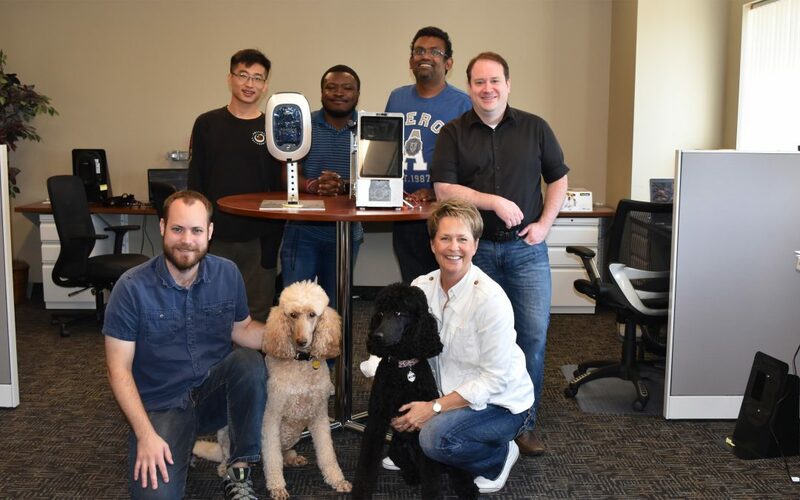 Similar to PetChatz, Ōmcare utilizes a two-way video platform that connects caregivers and patients while assisting in the remote dispensing of medication. “We are redefining medication assurance,” Lavin said. With work this important, a small business can’t do it all alone. That’s why Lavin used the SciTechsperience Internship Program to find and hire iOS developer Da Song and Android App developer Abiola Adimi. Working with Anser marked the first internship experience for both Song and Adimi, but they took to it, and took from it, with great enthusiasm. Da Song, a senior at the time, studying computer programing at the University of Minnesota, was assigned to work with Anser’s iOS team. There he worked on adding iOS functions and fixing programing bugs. Abiola Adimi, also a senior at the University of Minnesota, was majoring in computer engineering. When he came across Anser’s posting on the SciTech job board, he said, the prospect of getting to combine his interests in software and hardware was very appealing. Song and Adimi’s internship with Anser Innovation was a win-win. Anser found the qualified talent it needed and received a 50 percent wage reimbursement to help pay Song and Adimi. In return, Song and Adimi received valuable industry exposure, each getting a chance to add their work to a commercialized product that helped launch their professional careers. “Both of these guys now have coding in a project that’s live. That’s incredible!” said Chris Roed, a software engineer and intern supervisor at Anser. For many students like Song and Adimi, internships act as a crucial step between college and their career.